Janis CIRKSIS was a displaced person (DP) after the Soviet union annexed Latvia and the Baltic states during WWII. This is a continuation in the series of letters that he received from his homeland, translated into English. To see the other letters in the series click HERE. For more information on Latvian translations please see the Latvian Translations page. This is the 19th Letter in the series. You might notice a little paranoia in this letter - not unfounded I might add. You will note a lack of full names. In this letter, Kate refers to "Uncle P". I believe this refers to Peteris PIRTNIEKS, Janis's uncle who was deported to Siberia - see the post Postcards from Sibīrija. Sincere and loving greetings to you, dear brother, from - me, mum and dad!!! It’s a week now since mum greeted me on my arrival home from work with the words that today is again a very happy day, we have received a letter from Janis. We read the lines you had written with indescribable joy and emotion, for which we say thank you, but even more so for the photos, which gave us great pleasure. It seems to me, my dear brother, that you have not changed very much – your features are just as dear and familiar as before – long ago….. Also I would not say that you look older. Your goddaughter has grown a lot though, become much taller over these years. And, dear brother, it made us very happy and reassured us to see that you have settled in so nicely and I must say prosperously, that at least materially you are not poorly off, and have been able to settle in so nicely and well through your own efforts! – On Sunday I took the atlas again and traced place by place where you travelled till you got to the shores of your present place of abode. We thank God that you got there safely! You, dear brother, as I remember, used to admire the life of a sailor, now you have been able to experience a long sea voyage. Next Sunday I am going to the cemetery to plant jonquils and tulips on grandma’s grave, and I will then give her your love, from you, her grandson far away…Mum and dad were very moved by your words of gratitude for the care they gave you, and that for now is the most beautiful and the biggest gift that you can give them and also the knowledge that in exile you have kept your sense of honour, a pure heart and your health. You, dear brother, speak of repaying your parents in some way now. We know that it would be as great a joy for you to send something as for us to receive from you. Not because of the material value or need, it would give more pleasure as a proof of love. Still, dear brother, better not to do it now! Not because anything bad would happen to us because of it, but we are afraid that it might be noticed, or possibly cause envy and that then our contact through letters might be stopped. That is for now the most precious and joyful thing to us, that we can communicate. We are not in poverty, dear brother, we do not lack anything. We are a small family and know how to manage and to work. Last summer we bought furniture for me as well, a wardrobe, couch, bookcase, table, bedside cabinet, we only didn’t have enough money for chairs, we will get those later on. We sold the smoked bacon from one pig, were able to save a bit from a heifer and the strawberries, and that is how we were able to do it. That’s how mum wanted it and it’s not bad. At least for now….. The furniture is really nice. You say, dear brother, that we should not deprive ourselves and save for you. But we have sheep, mum knows how to weave cloth herself, knit gloves and socks, we can’t wear it all out ourselves. And it gives mum pleasure and comfort that she can put aside something useful while waiting for you (pl.). – You say, dear brother, that you would like to exchange letters at least a couple of times a year. I think that that would not be quite often enough, we would have to wait too long. In my opinion five or six letters would not be a lot and not conspicuous, nobody will forbid us that, and we can permit ourselves that much. Better not the parcels, though. The greatest joy to us, to our parents, will be you yourself, when fate permits it!... I could have taken the easy road in life, as they say, but have never wanted to do that, and the illness that mum had assisted me in that, as if by fate. “Smoke-filled and dusty work, but let the sky remain bright.” We have helped uncle P.’s family a lot with parcels. Dainis has now grown into a good-looking and strapping lad, 18 years old. Little Janis with diabetes is now resting in the earth over there. Peteris S.’ father and young brother as well, we still correspond with his mother now and again and send a parcel. It is better for them all there now. Some have returned. Old Mrs Str. asks if you know anything about her V. With loving greetings and all the best! Until we meet! PS. I am enclosing two photos. 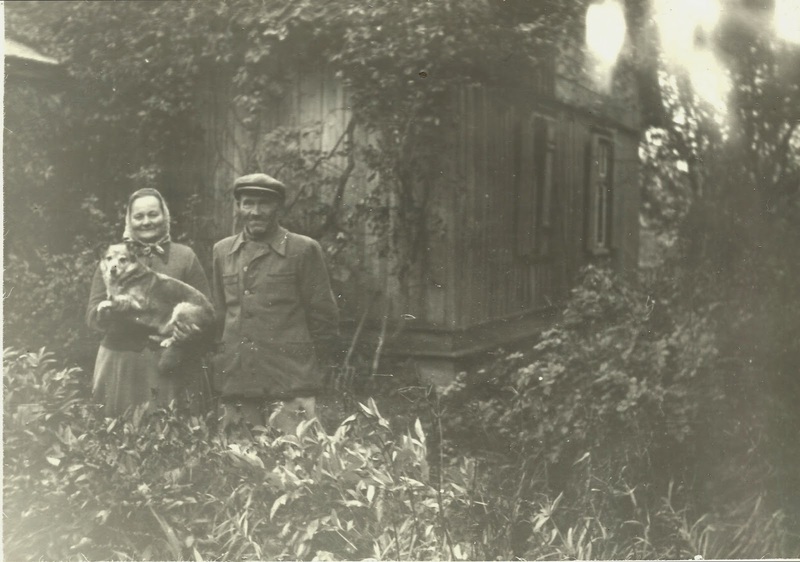 In one mum and dad by the veranda, in the other cutting the rye at the kolkhoz by our house. Mum had brought out the afternoon snack, we were reaping by the edge of the field and so she is with our group. Pretending we are having our snack. 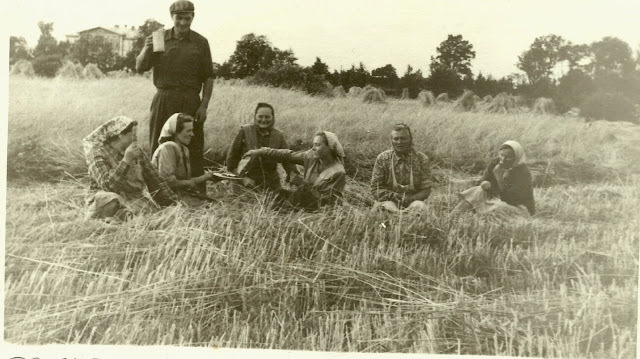 Cutting rye at the kolkhoz near the family house. The workers pose for the camera pretending to have a snack. PS. When the apple trees are flowering, we will get our cousin Peteris K. to take photos of us all. – The spring is late this year. A few days ago there was a wild snowstorm, it stopped the car traffic. Now the snow has melted. The winter flowers are showing above the ground. I have a lot of jonquils and white and red tulips.